Your mission is to preserve and protect the objects entrusted to your care, and our mission is to help. We support institutions of all sizes in their efforts to manage risk, boost community engagement, optimize space, and stretch limited budgets. While every collection is different, the risks to stored items generally fall into one of ten categories. It’s important to understand the “Ten Agents of Deterioration” in order to mitigate the effects of these damaging factors. The risk: Sudden shock or long-term pressure breaks and deforms objects. Optional earthquake bars prevent jars and objects on shelves from accidental falls and spills. Anti-tip rail systems are designed to provide stability and reliability for compact shelving in seismically active areas. The risk: Insects and rodents eat and nest in organic collections, while mold can consume and stain organic materials. Easily-cleanable, sealed cabinets keep pests away and allow for easy inspection. Light-colored equipment facilitates pest detection. The risk: High temperatures speed up the chemical deterioration of unstable materials. To make the most efficient use of expensive cooler space, large institutions can use compactors housed in cold rooms and walk-in freezers. 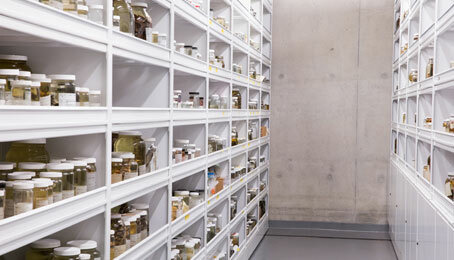 Medium sized collections can use shelving or museum cabinets housed in walk-in coolers. Smaller collections can use upright refrigerators or freezers. Learn more about your options by requesting a free, no obligation space assessment from a nearby Spacesaver consultant. 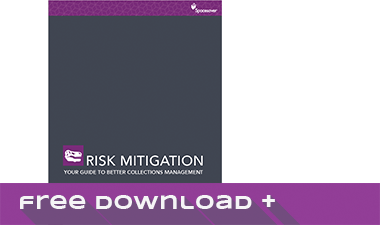 Learn more about the Risk Mitigation and how you can start planning today to better protect your collection. How you can start planning today to better protect your collection. As museums seek new ways to engage with their communities, Spacesaver is a proud partner in developing creative solutions for visible storage. Our local distributors work with architects and designers, as well as our in-house project management teams, to create systems that promote engagement while still maintaining the highest standards in collections care. Learn how the Arizona State Museum helped visitors understand the breadth and depth of its renowned Southwest pottery and basketry collections. Space gets tight when collections grow, and this can result in cramped work areas for staff and less-than-optimal environmental conditions for collections. 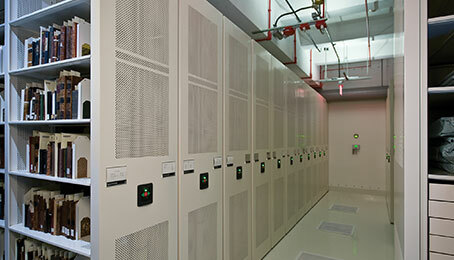 Optimizing space in collections areas helps promote efficiency, maintain organization, and protect collections. High-density storage systems, often called “compactors,” eliminate empty aisle space by mounting shelving or cabinets on carriages that move along rails. Columns, ductwork, overhead sprinkler systems, and other structural obstacles pose unique challenges. Our consultants design storage systems that comply with applicable codes while still making the best use of available space. Our flexible manufacturing processes enable us to manufacture shelving and art racks of virtually any height, allowing our clients to take full advantage of the vertical space in their facilities. We help institutions large and small make the best use of their space and their budget. While our products are not cheap, many of our clients find that our free space planning services, ability to repurpose and attention to detail end up saving precious funds in the long run. Spacesaver’s network of local distributors, backed up by our in-house planning and project management teams, offers unparalleled service and attention to detail. Your local Spacesaver consultant should get involved in the early planning stage to ensure the best result; he or she can even create preliminary drawings to show to potential funders. Part of the space planning process involves projecting future growth, even if funding is unavailable at the time of renovation or construction. Sometimes, for instance, rails for high-density systems are installed during construction and carriages are added years later, when collections have grown and more funding is available. The Columbia River Maritime Museum pursued a similar strategy, installing a rail system that could support full-height shelving but installing shorter shelving that should be able to accommodate the museum’s growing collection for the next 20 years. The museum is planning to invest in taller shelves at that time and installing it on the existing rails. Our engineering and manufacturing teams can design and build new cabinets, shelving, drawers, trays, and other storage equipment to integrate seamlessly with your institution’s existing assets. For instance, we worked with the Chicago Field Museum to design and build cabinets that accommodated entomology drawers that the institution already owned. Spacesaver products can be purchased at significant savings through GSA contracts, various state contracts, NJPA, and National IPA. 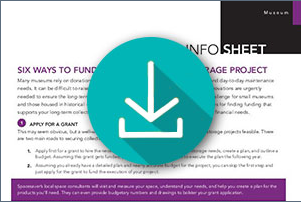 Learn about options for acquiring funding that support long-term collections management goals while balancing short-term financial needs.